My tennis involvement actually began with my brother (currently 11 years old) starting to play tennis competitively. I had to learn the rules if I wanted to cheer for him in his matches, and so it began. But you can't really become obsessed with a sport if you only watch kids play it once a month*. So, the first pro match I sat down to watch was the Davis Cup tie between Israel and Russia, quarterfinals of the World Group. Winning it was one of the best Israeli achievements in tennis, and I remember telling my family afterwards: "If Germany beats Spain, we'll be hosting the semifinals - and we have to get tickets!" Of course, Germany didn't beat the Armada, and so - we had to wait over a year before there was another tie on our home ground. In the meantime, our team lost to Chile, and what we came to watch in September 2010 was the World Group Playoff between Austria and Israel. The first match has given us hope, as Dudi Sela (on your left) beat Andreas Haider-Maurer in straight sets without particular problems. 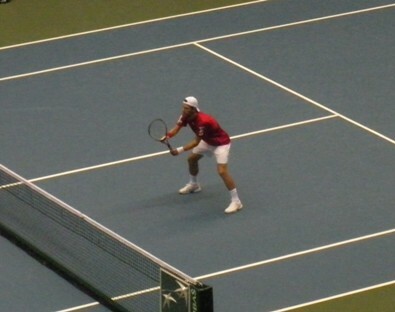 Next, however, was Jurgen Melzer, a Top 15 player at that time. Harel Levi, of course, was no match for Melzer, who sent us back home with 1-1 at the end of the first day. 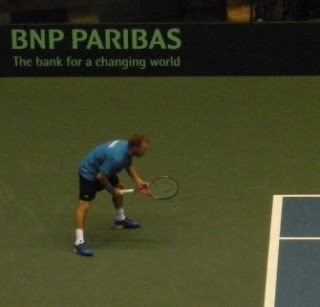 We came back the next morning, to cheer for Yoni Erlich and Andy Ram, who played against Melzer and Alexander Peya. This was a day with tough scheduling, as it was the eve of Yom Kippur, a Jewish holiday on which Israel completely stops for a day and a half. Literally stops - all businesses are closed, no TV broadcasts, no cars on the roads... So, in addition to the tie being played on Thursday, Friday and Sunday instead of the usually Fri-Sun, there was a bit of a pressure on the players to finish the match as quick as they could, I think. Luckily for us, Ram & Erlich beat the Austrian team in three close sets, and all the spectators were able to get home before the holiday arrived. To make a long story short, both Sela and Levi lost their last day matches, with Israel falling behind to the Group I tier (where, frankly, it probably belongs more than WG). But even though the results were a bit discouraging, the live tennis experience was definitely the best. Seeing it all happen in front of you, cheering with the crowd, really rooting for the players you're watching - it was simply great. But maybe the best part of those days was my brother's attempt to get autographs from all involved. We were all very happy when he managed to get not only all the Israelis' signatures, but Melzer's, as well (in red marker, might I add). This started a tradition of a sorts - now, for every tournament I visit, I bring with me the small notebook with the autographs, and try to add some more to the pile. And you know what? It's just fun.